You’re probably worried that you will find your walls with a handprint or two, drawings and smudges of ink. 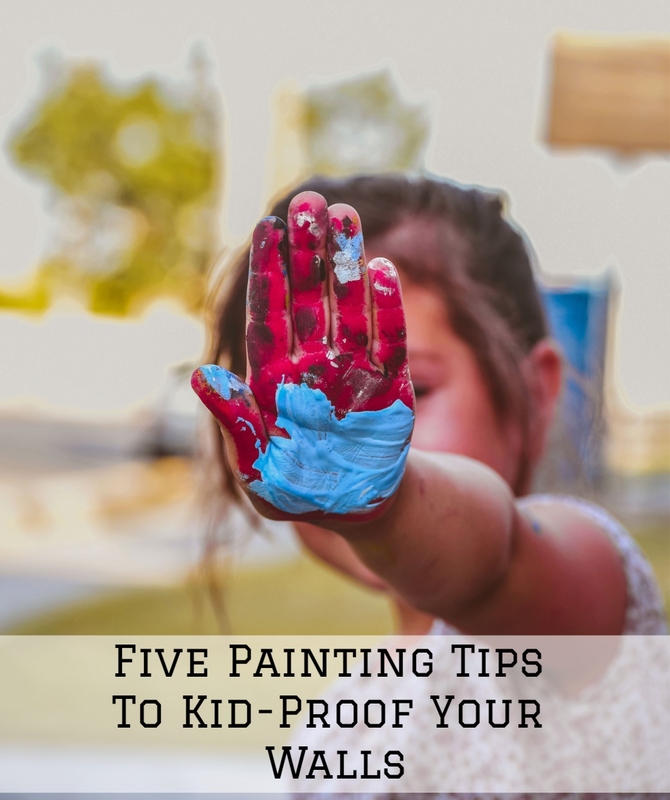 To avoid this (or at least minimize it) here are some five easy ways to kid-proof your walls while keeping your kids safe. Choose high quality, washable, low-VOC paint finish. Also, consider using durable paints specifically designed for areas with high traffic. This will ensure that you will still be able to easily clean the walls as often without them losing their color and sheen. With high-quality paints, you can go for your preferred color without fear as they can be wildly scrubbed and still look relatively new –the higher the quality the more washing it can handle. Well, you might have this fine, high-quality paint that can be washed multiple times and is still cool with all its lustrous look but let’s be real, no one wants to keep guard on those walls every hour wondering when the little wild wall artist is going to strike. Take a moment and choose painting color that is a few shades darker than what you would have traditionally picked. This will help conceal markings easily especially in high traffic areas such as hallways, dining area or the stairs. Bright colors such as white, yellow or blue are not the best choice for a young family; consider purple, grey or beige as a neutral way to keep your kids’ tiny handprints concealed. Marker boards are a fine way for young ones to explore their ‘fine arts’ and writing experience minus the eyesore effects on your pristine walls. Place this marker boards in their playroom or individual kid’s room. Ensure that you use non-toxic markers that are also not permanent. You can also let them express their creativity through chalkboard paint. Paint a small section of their bedroom with this unique material, and your little artists can play to their hearts’ content without damaging the rest of your house. Finishing your walls with high gloss or semi-gloss will ensure that all the marks and stains on the walls that the kids left behind can be easily wiped off; paint markings should also be washed off as soon as possible. Consider using it in rooms where the kids are most active like their rooms and the dining area. If a gloss finish is not up to your taste, you can choose any paint with a washable label on it. Also, consider surface protector paints that will prevent handprints, footprints, drawings and even smudges from sticking to the walls permanently. Teflon lowers the penetrating ability of marks on your walls. It will help you clear marks and stains from the walls with a wipe. Well, we all love solid colors, especially to actuate our architectural style, but handprints and stains can easily be picked up and our homes won’t be as elegant in the end. Choosing a faux or sponging finish will keep those smudges somewhat well-hidden. Such style not only camouflages stains and prints better than any solid color would but also creates a lively environment for your home. And the best of it all, when you have stubborn stains you can’t wash, you can simply dab similar paint over the stain and have it blend in with the original look effortlessly. Concealing your little ones’ misplaced art can only go so far, when your interior walls become extremely stained or start showing signs of paint failure such as fading, chalking, peeling or bubbling, it’s time for a new repaint, and that’s where Eason Painting Company comes in. We have years of experience in residential painting serving the areas of Clinton Township, MI, Macomb Township, Rochester Hills, Washington Township, Ray Township, Rochester, Armada, Troy, and Chesterfield. Give us a call today for a free estimate or more information.